Due to the limited edition aspect of the shoes, I didn’t get these out and tested for an extended amount of time. In the past week leading up to this review, I have taken the shoes out for a few range sessions and walked three rounds. 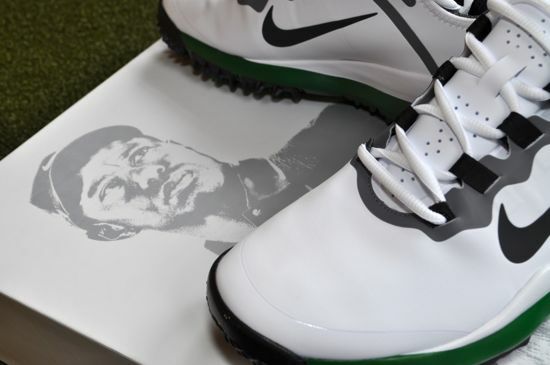 Everyone has had their eyes on Tiger lately and one of those things that you might have noticed was the addition of the TW13 shoes to Tiger’s lineup. 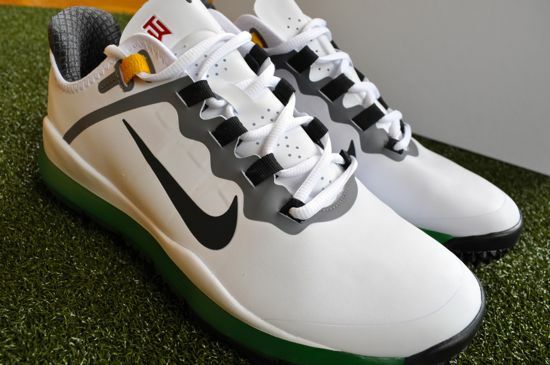 The shoe has been undergoing ongoing design and updates and is somewhere between and standard cross-training shoe (like the Nike Free) and a traditional golf shoe. 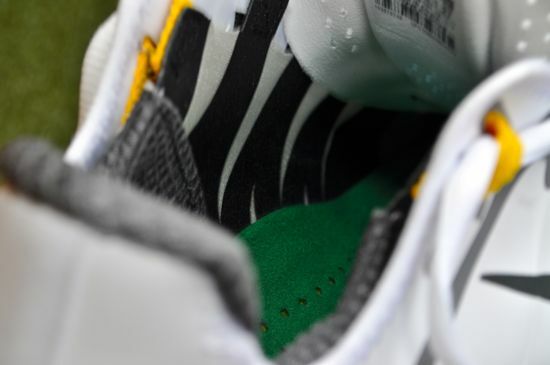 The version of the shoe that is pictured here is the (limited edition) Masters color combination created specifically to coincide with the Masters golf tournament. The colors are what you would expect – a hint of that deep Augusta green with a touch of strong yellow. A bit understated – but certainly noticeably different from the normal TW13 colors. The fit is very similar to the Nike Free and chances are that you’ll likely enjoy this golf shoe if you wear Nike shoes in the gym or for any other sporting events. The comfort is very good and there is enough cushioning to keep your feet easily comfortable while walking the course. 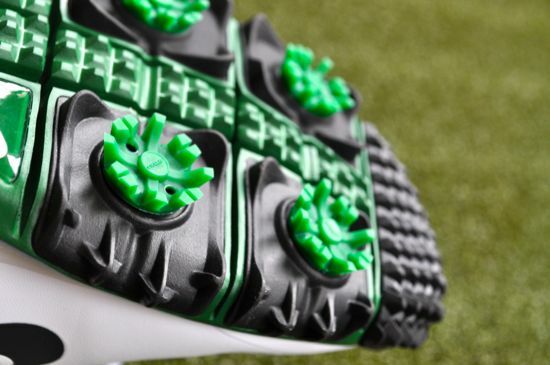 The soles of the shoes have plenty of traction and you can trust that these shoes will keep you grounded in your swing as good as any other golf shoe out there. The soles have deep rubber spikes built into the shoe and also have traditional and removable / replaceable spikes. 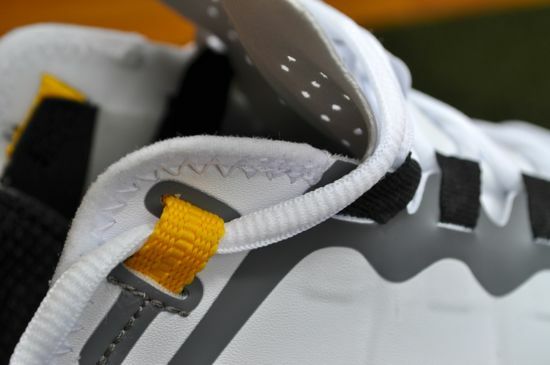 The loops for the laces and the reinforcement “fingers” inside the shoes give the fit a nice and locked-in feeling and form well to the foot. The insole and cushioning in the sole of the shoes is very comfortable although it ended up being a little too much cushioning for my taste. The material that the shoes is made from is a synthetic leather that doesn’t really feel like leather at all. I’m not sure of another shoe or material that I can compare the TW13 to, it’s a thin and waterproof material that seems to stay clean, keep moisture out, and flex to any shape needed. This is a great shoe if you’re looking to move away from traditional golf shoes and the TW13 does feel very much like the Nike Free adapted for golf. The shoe is very light and looks great with both pants and shorts on the course. 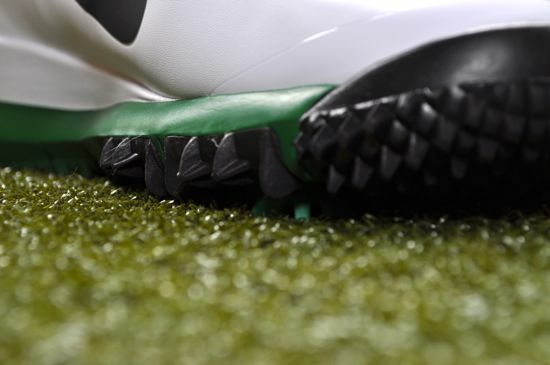 The feel of the TW13 isn’t the same as the minimalist shoes that have been gaining traction in the golf world. The extra cushioning and elevated heel still leave you in a traditional posture and the toe-box is much tighter on the TW13 than on the other minimalist shoes out there. 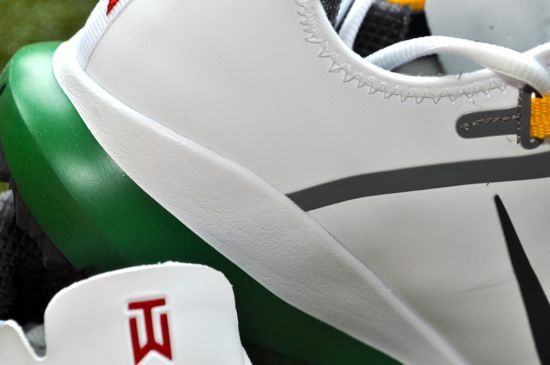 If you’re looking for a high-performance golf shoe that is styled differently than traditional golf shoes and still looking for a traditional (although much more comfortable) fit – then the TW13s are worth checking out. The traditional color combinations are great and the Masters color combination is even better. If you’d like to see more images of the Tiger Wood Masters Edition TW13, we have many more pictures of this shoe posted over on our Facebook page.